How would YOU spend a million? Takeaway pizza – or world peace? The laugh-out-loud story of two boys, a huge sack of money and a bazillion bonkers choices! Britain is about to convert to the Euro, and in a few days the pound will be useless. So when Damian and Anthony get caught up in a train robbery and end up with a massive bag of stolen swag, they have a glorious dilemma on their hands. How should they spend the cash before it becomes worthless? Meanwhile, the bungling robbers are closing in. The clock is ticking. Pizzas or world peace: what’s it going to be? Six copies of this classic children’s book to accompany Read & Respond: Millions. This book contains mature language. 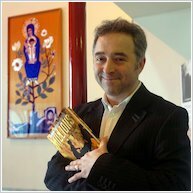 Frank Cottrell Boyce is a screenwriter whose films include Welcome to Sarajevo, Hilary and Jackie and Millions, which was also his first book. He has also written episodes of Coronation Street and Brookside, so you probably know his stories from your TV set. He also wrote the London 2012 Olympics Opening Ceremony! 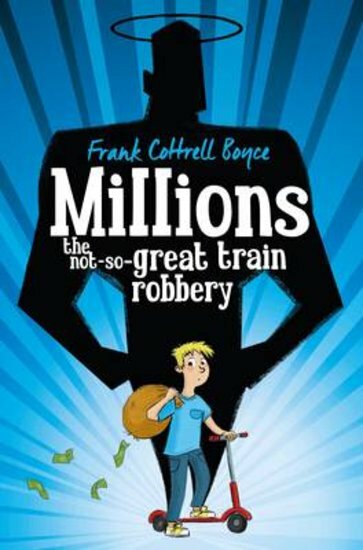 His first children’s book Millions won the Carnegie medal, and was made into a film by Danny Boyle. He used to run a Punch and Judy show, earning a fortune in small change, and just like Damian in Millions, he is a Catholic who is fascinated by stories of the saints. He is not a millionaire and has no plans to rob a bank! However, during a short-lived career as an assistant at a puppet show, he earned a fortune entirely in small change. He believes this is how he first became interested in the problems created by user-unfriendly cash. Just like Damian in Millions, he is a Catholic who is fascinated by stories of the saints. His second book, Framed was inspired by a news story he’d read in an old scrapbook: During the Second World War, a collection of valuable paintings from the National Gallery was hidden in a slate mine for safekeeping. He couldn’t resist imagining how all of that great art might have affected the people who lived near the mine. Frank lives in Liverpool, with his wife and family of seven children.